What a conclusion to a season! Had the greatest opportunity to perform and conduct on the Music of Eric Mandat Concert at the International Clarinet Association in Orlando, Florida. 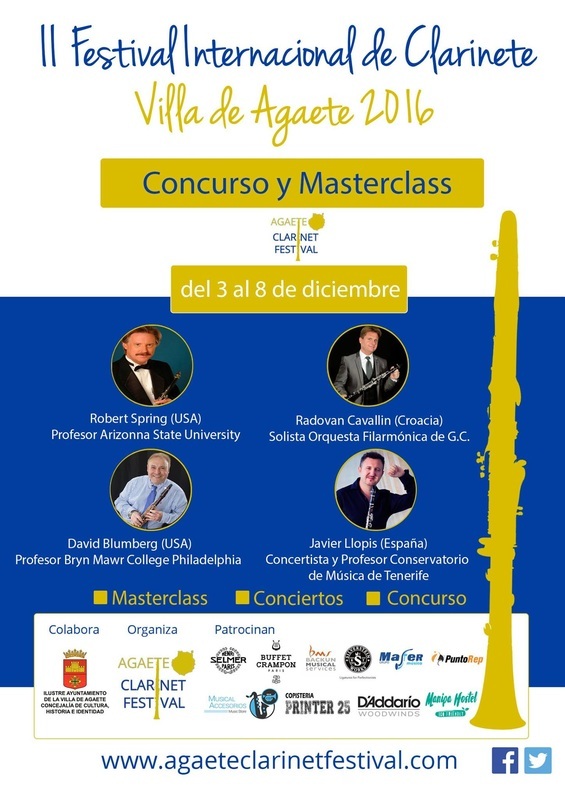 Prior to that, I made it as a finalist for the Research Competition with "Croatian Clarinet Concertos: The Cultivation of Tradition after 1952". I have always learned a lot from attending events like these from either watching different performances, rehearsing, or even just speaking to people. The difficult part about competitions is that it is always subjective and always have to prepare yourself for the results - good or bad. Despite the end result, you always have to dust off your knees and keep going. I am determined to have my project published because I believe so strongly in it. That's something I learned was to continue believing in what you do. For Eric's concert, I performed I. Portent, which is the first movement of Tricolor Capers. Wesley Ferreira performed the other two movements II. Bop and III. Sway. Here, Mandat uses a lot of the musical material he establishes in the first movement in the other two movements. I also stepped in for another clarinetist who was not able to make it for Ritual, which I performed with Season Cowley. It was a good experience. I never had the chance to really study Eric's music at depth when I studied with him and was really happy to share that with people. Then we had a chance to perform the first movement of Concert Music For Clarinets - one of Eric's most challenging and demanding works. We did this work at his Tribute Concert in Carbondale, IL. What I've always loved about Eric's music is that even though it is so difficult - it makes sense at the end. There's always something that the listener holds onto when they are experiencing this music. Every time I entertained the thought of composing something, it always ended up in the bin! It was quite the experience and this is where I learned the most as a conductor. There were difficult rehearsals, but we overcame them with the little rehearsal time we had. After one rehearsal, I spent a sleepless night rethinking and problem-solving many of the compound mixed meters in the work that were difficult to conduct, along with the transitions in his work. Despite this, it was a blessing to have this All-Star Team of musicians performing the work! I am sharing this with you because it is all a process. Yes, our world tells us we have to be perfect from Day 1. Yes, we have to always be on our game. Yes, we must always maintain professionalism, but we are also human. It is normal to feel frustrated and angry when things don't work right away, but that doesn't mean they don't at the end. As musicians, we create the musical environment that surrounds us - no matter how good or bad it sounds. After Radovan Cavallin's performance of Oscar Navarro's Second Clarinet Concerto. A little late on this one! It's been a busy summer. 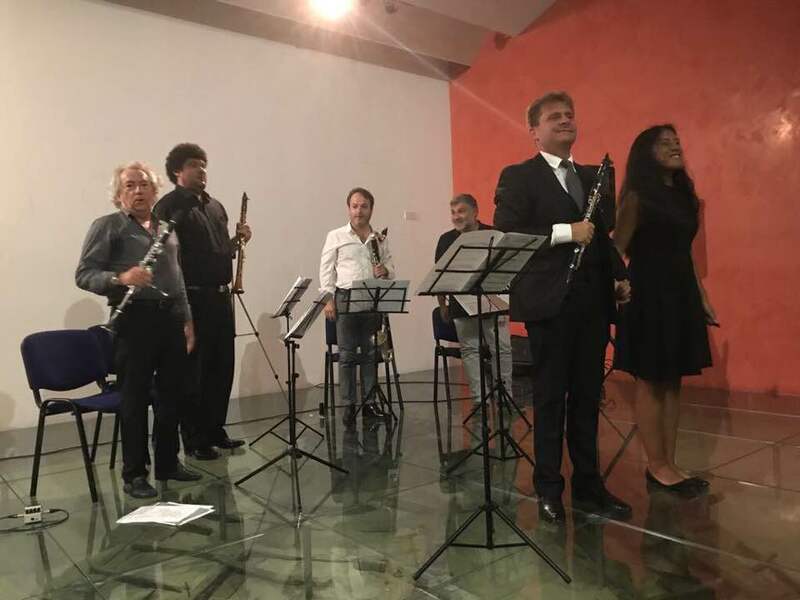 So, this summer I had the opportunity to conduct Oscar Navarro's Second Clarinet Concerto with Radovan Cavallin as the soloist at the first edition of the Cyprus Clarinet Festival ​in Agia Napa. Radovan had performed it previously with the Banda Sinfônica Municipal de Las Palmas with Navarro conducting....so I had some big shoes to fill. We had a lot of concerts! The first night featured one of my favorites, Nuno Pinto performing with electronics with my great friend, George Georgiou. Hedwig and Angelos performed a concert featuring duos and clarinet with delayed step! It was an absolute blast to be exposed to repertoire I have never heard before and being inspired by so many great performances by wonderful clarinetists! It wasn't completely all work - we had a chance to sneak off to the beach in Agia Napa and swim in the Mediterranean Ocean! We also took advantage of the beautiful city and had REAL Cypriote food. We had a chance to see the Ancient Ruins and to have free wine tasting, by the one and only, Francis Guy! He also played an important role in the festival making sure things ran smoothly. We felt so welcome - so happy to be there! The students had a lot of fun and that was the most important thing. This was the first clarinet festival they had in Cyprus. We were able to bring international performers to one spot and to provide the best information to them as possible. 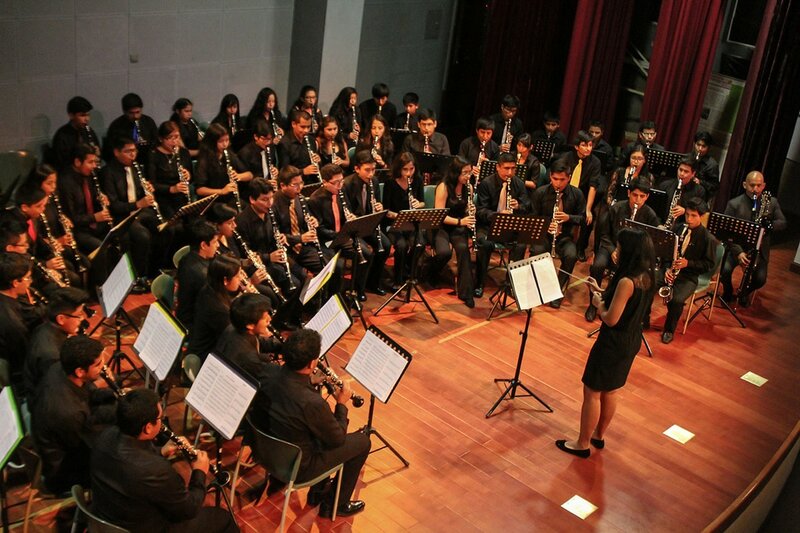 They had a chance to perform in the clarinet choir and perform in chamber ensembles for the final concert. After the VIMM 2017 clarinet choir concert with Tomaz Kmetic. The Virovitica International Musical Meeting (VIMM 2017) took place in Virovitica, Croatia. It's a small village outside of Zagreb, which is about two and half hours away by train. When I first arrived, I wasn't sure what to expect. I was in Croatia the week before doing further research on my research project for the International Clarinet Association Research Competition. 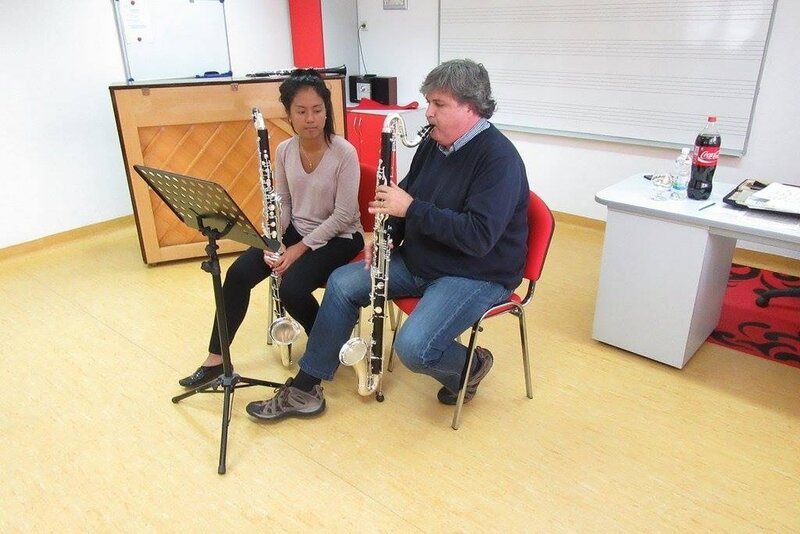 This year, I decided to take the bass clarinet course offered at VIMM with Luis Gomes. It was a great experience and the worst part is...I did not anticipate falling in love with that instrument as much as I did!!! Our world gets too caught up with age or ability. There have been countless people who have told me that I can't do things in my life. This is a big thank you for those people because you inspire me to always push myself to be the best person we can be. We made it to Porto! It was quite the drive from Lisbon...we managed it without a sweat, except the flu we all managed to get on the way there. From December 16th-19th, the Portuguese Clarinet Association organized their International Clarinet Festival hosted by the Conservatorio de Musica in Porto. On December 19th, we had the greatest opportunity to perform a homage program featuring Eric´s music. It was a very busy time for us! We had to cram rehearsal time, meet at odd times during the day, practice like crazy people, and at the end of the day...we did it! As much as I admire Eric´s music, it can be a big challege at times to make sure all the metric changes, multiphonics, and the small musical nuances come out just right! This program also featured Portuguese clarinetists, Nuno Pinto, Hugo Quieros, and Marcio Pereira! They were excellent contributions to this concert and it was such an honor to perform with them. We made a lot of new friends, sang a lot of songs, and overall had a very good time. It was very humbling to hear and see young clarinetists performing for these international aritsts at the event. It was truly a privelage to see the different concerts to feel inspired to continue to make the best music we all can...no matter where you are in your life. I Encontro Clarinetes da Universidade de Evora! What a whirlwind tour! 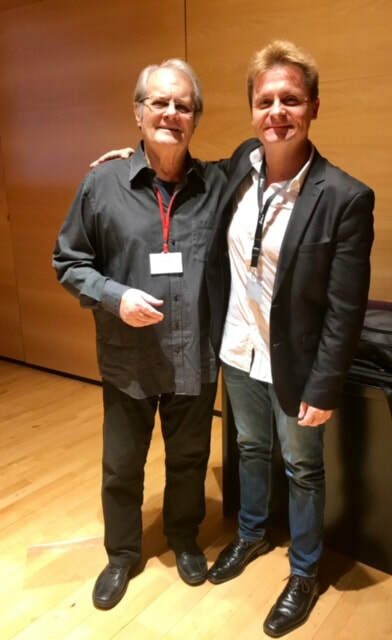 My dear mentor and friend, Eric Mandat, came from the United States to perform a series of concerts in Portugal. Bob Spring, Jeremy Wohletz, and Radovan Cavallin performed on these concerts, too. From December 11th to the 14th, we were all a part of the I. Econtro da Clarinetes de Universidade de Evora. It was a big event. 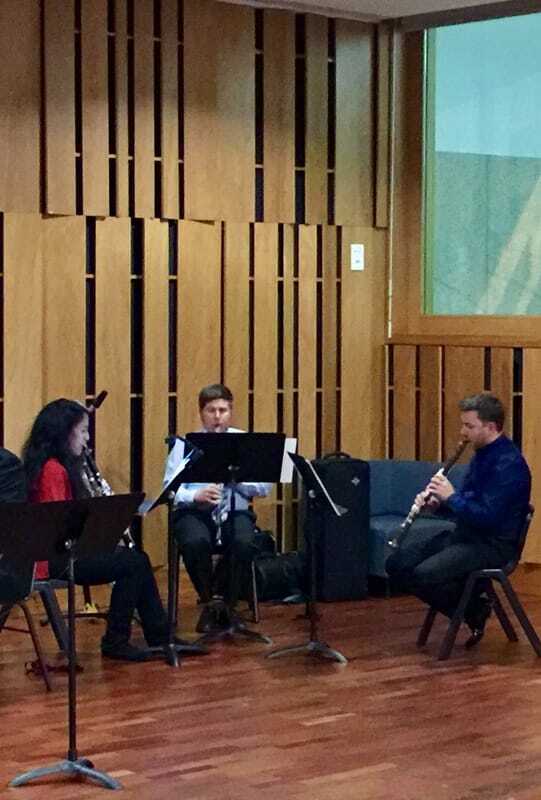 Not only did we performed a program featuring Eric´s music, we also had a clarinet ensemble concert. 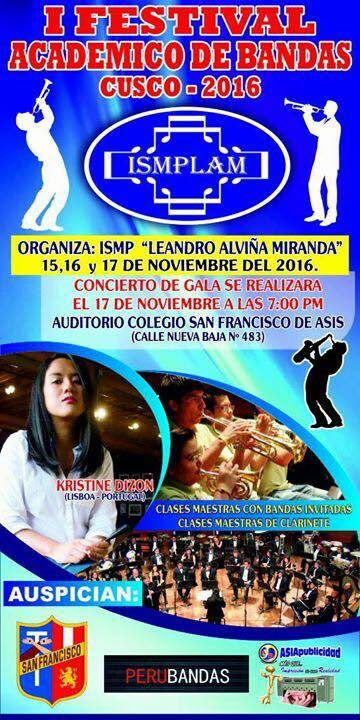 This concert featured solo perofrmances of Luis, Ana Rita, and Radovan. There were also duos featuring Eric, Luis, Bob, and Radovan. I assisted Bob Spring in conducting the ensemble. There was another conductor, Pedro Ralo, who conducted the performances with the Portuguese clarinet professors. The concert concluded with Bob and Radovan playing an encore by Mihael Paar. It was a fantastic experience. I am thankful to Luis Gomes and his students for believing so strongly in this project and it´s overall success! Just came back from the Canary Islands! 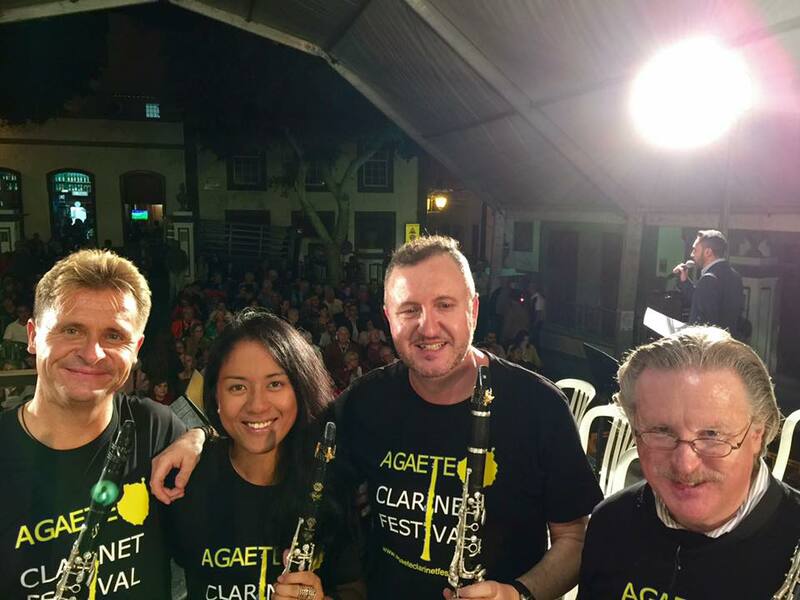 I was helping support the II Festival Internacional de Clarinete Villa de Agaete 2016! One of my great friends and clarinet pedagogue extraordinaire, Bob Spring from Arizona State University, taught a series of masterclasses and performed as a soloist with the wind ensemble. 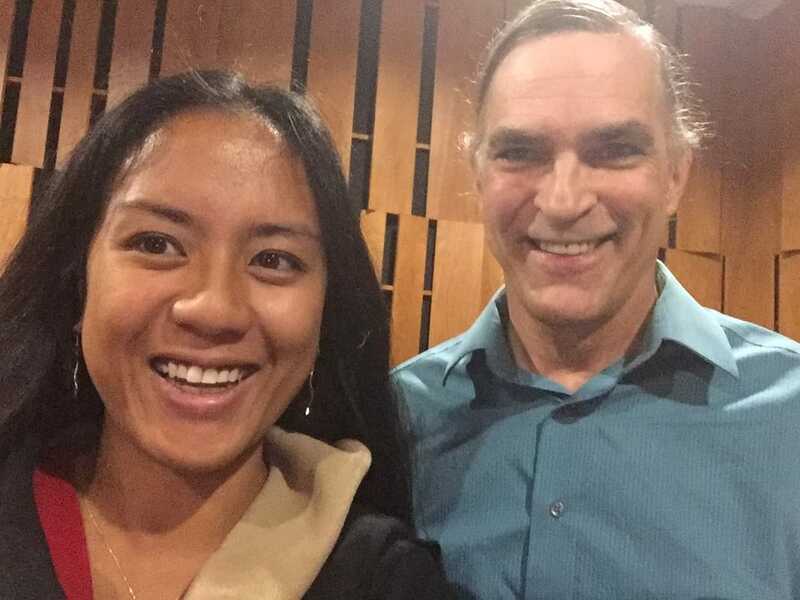 It was a very big honor to have him here! There were exhibitions by Backun, D'addario, Buffet, and Selmer! Bob also presented a special masterclass to the students about his famous warm-up! It was also a great reminder to how much the fundamentals play such an important role in our continuing musical development. I had the opportunity to play clarinet quartets with the faculty there. It was amazing to perform with Bob, Javier, and Radovan. It was such a humbling and rewarding experience for me. There were also concerts by ClariKids, led by Laura Sanchez. It was a pleasure to see her work with all the young students! Highly recommend this festival for all levels! Radovan Cavallin, me, Javier Llopis, and Bob Spring! One of my biggest dreams was to visit Peru and Machupicchu! 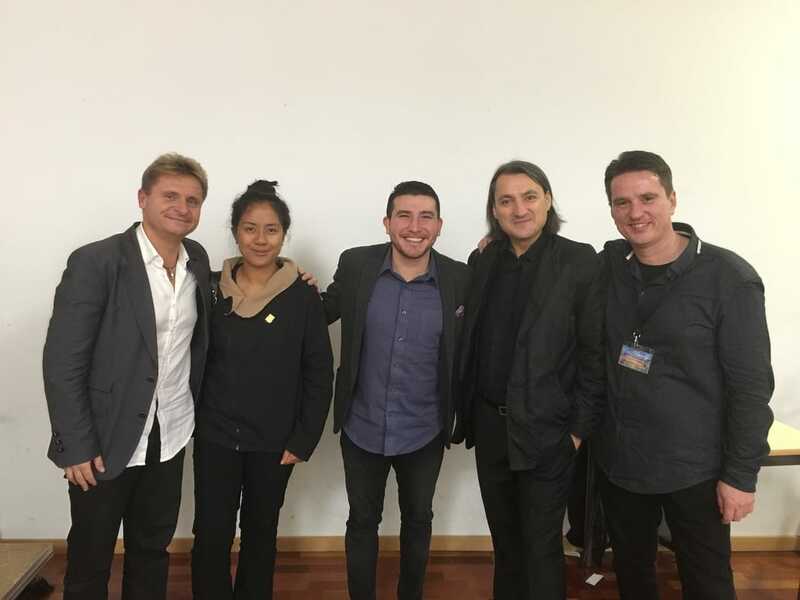 I never thought in my life that it would have been possible, until I was invited by one of the most gentle souls in the world, Hospina Moises, to serve as an international jury member for the V Concurso de Bandas Escolares at the Colegio de Alfonso Ugarte and to guest conduct at different schools. 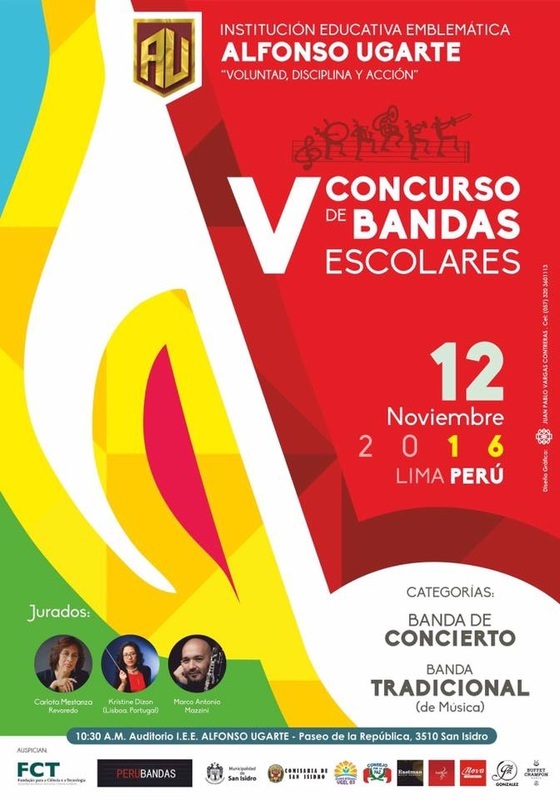 In addition, I was the guest conductor for the I Festival Academico de Bandas Cusco - 2016. My residency was from November 10-24, 2016. 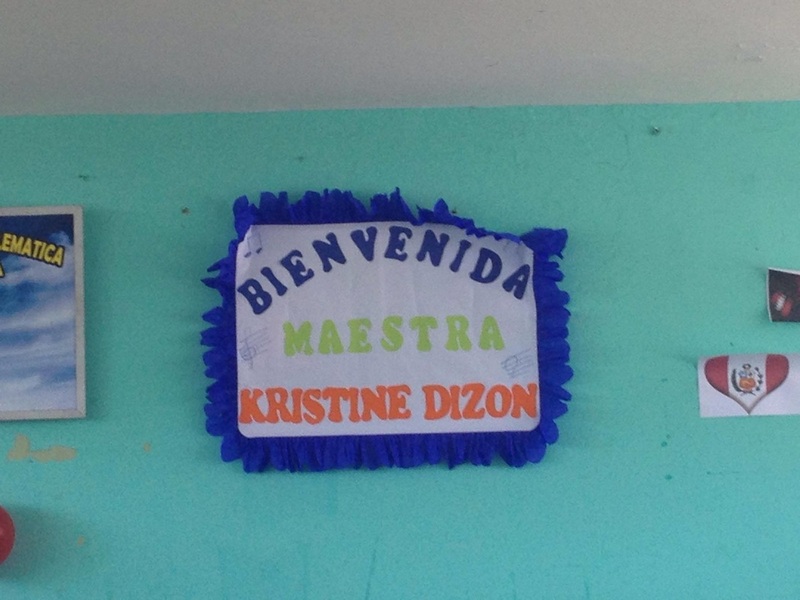 During my residency, I taught at fifteen schools in Lima and Cusco. I also had the opportunity to guest conduct the military and police bands. With each band, I focused on their weaknesses and building upon their strengths. This balance allows students to build confidence in themselves, but also as people. Music is one of the most valuable gifts that you can give to someone. I told the band directors at the different schools how much respect and admiration I have for the work they do because it is the hardest. The compassion these teachers have for their students is addictive. PeruBandas arranged it so that I would have a day at Machupicchu. There are no words to describe how magnificient this place is. One of the tour guides mentioned that Machupicchu will be closed off to the public in fifty years. Go while you have a chance! You will definitely not regret it. It was one of the most valuable and unforgetable experiences I've had in my life. I have never seen such desire for knowledge and information. My genuine hope is that they learned as much from me as I learned from them.